Acquire and XSEED reveal one of the most beautiful PlayStation Vita games we've seen. 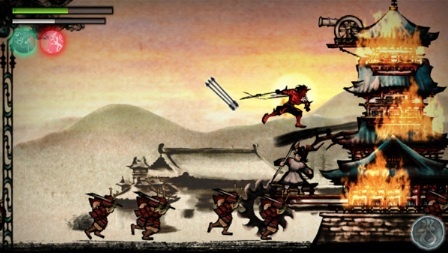 Sumioni: Demon Arts reminds us of Capcom's Okami, in the sense that you harness the power of ink to make spectacular things happen, but on a much grander scale. In this wonderful looking 2D platform adventure, set to arrive on PlayStation Vita within the system's launch window, you explore a gorgeous pastel and charcoal world teeming with enemies and obstacles. How you deal with all these things, well, heavily depends on your imagination. Approach a bowman sitting all cozy in a tower, and you have several options. Hack it to bits, or whip out your paintbrush and draw a bridge that grants safe passage? Too nice? How about setting that sucker ablaze, or summoning a thundercloud? What? Amateur punk stuff? OK, go ahead and call upon a mighty phoenix or lion spirit. That should do the trick. As you'll see from the video, the power of choice drives this promising effort from Acquire and publisher XSEED. Quite frankly, we can't wait to get our hands on it. Yup, PlayStation Vita continues to look better with each passing day.